As mentioned in the June post, the high inventories of cheese and butter present a troubling picture for Class III dairy prices. 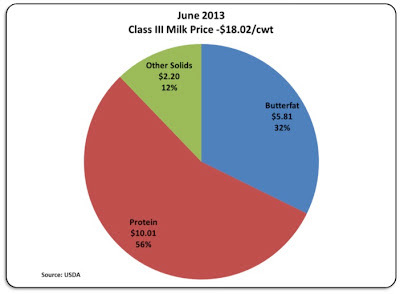 The data in the June post has been updated to provide current insights into the risks of Class III dairy prices. Exports are up but not enough to reduce inventories. Therefore, Class III futures are declining. Charts of the NASS cheese and butter prices are shown below. Current Class III futures have fallen to the mid $17/cwt. levels. For more charts and explanations click on this link to the updated June post. June milk prices are stable, but inventories are high. On July 3, the June 2013 Milk Class and Component Prices were announced. The Class III milk price was $18.02/cwt., down 3% from the prior month. Cheese prices also fell 3% and butter prices fell 6%. 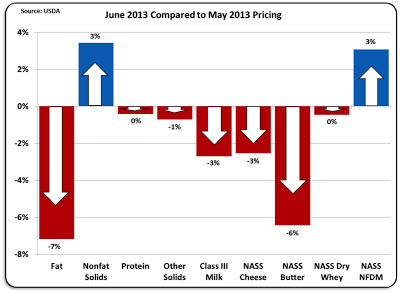 Milk protein was stable at $3.35/lb., but milk fat took a significant 7% drop to $1.66/lb. 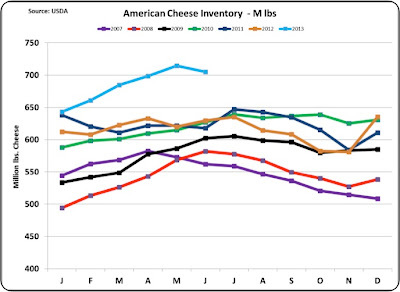 Inventories of cheese and butter remain very high and if not reduced, will weigh heavily on future pricing. Long term trends for Class III components remain the same. Milk protein is showing expected strength at twice the value of milk fat. "Other solids" is maintaining its new value range with only a slight drop in pricing at $.39/lb. As a result of the changes, the percentage of the milk check that comes from milk protein jumped to 56% of the Class III price. This chart is based on the USDA standard of 3.5% milk fat and 3.0% milk protein. Clearly, the best revenue path for a producer is to increase milk protein. Amino Acid balancing of feed is key to achieving higher milk protein and higher milk revenue. 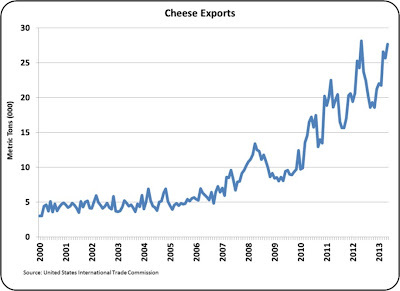 Exports of cheese and butter have continued at 2012 levels. 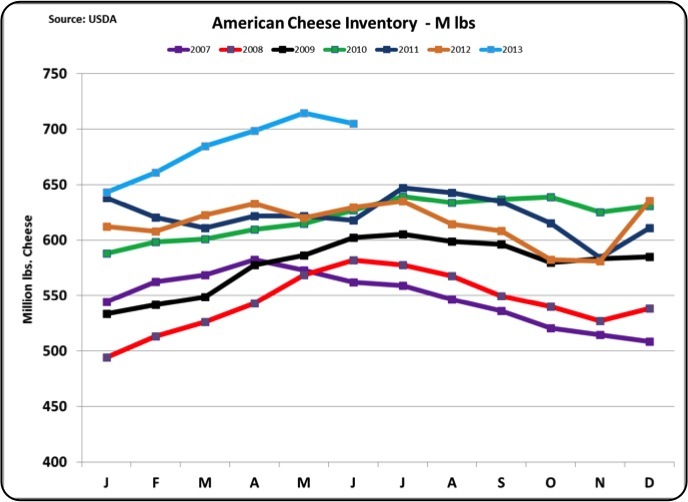 As a result, the inventories of cheese and butter have increased from the prior month. 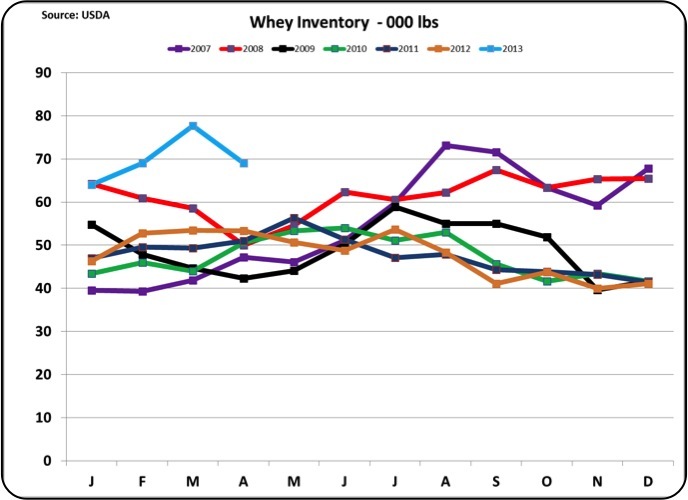 Whey and nonfat dry milk exports are up slightly. Cheese exports are very important to cheese disappearance. Although exchange rates are favorable, exports are up only slightly vs. the prior year. 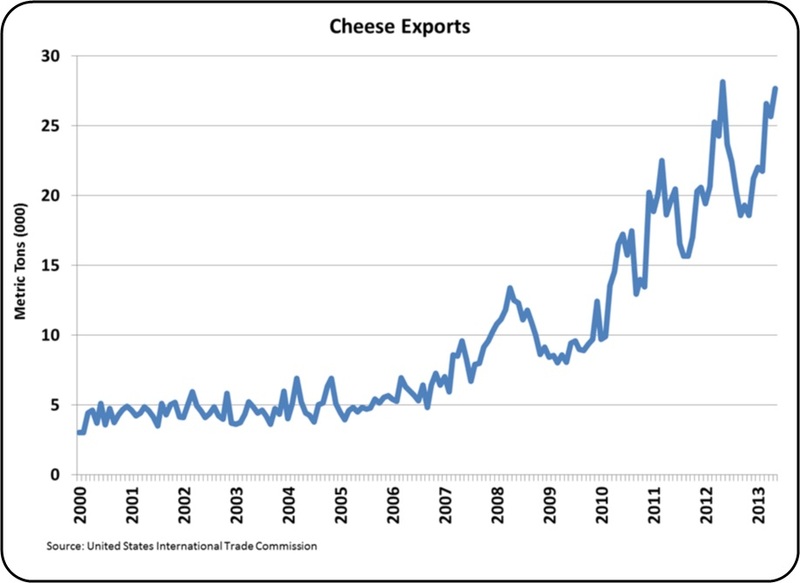 Cheese exports account for about 5% of cheese disappearance but can be very volatile based on exchange rates and global supply and demand. The updated data shows an 8% increase over the prior month in exports. 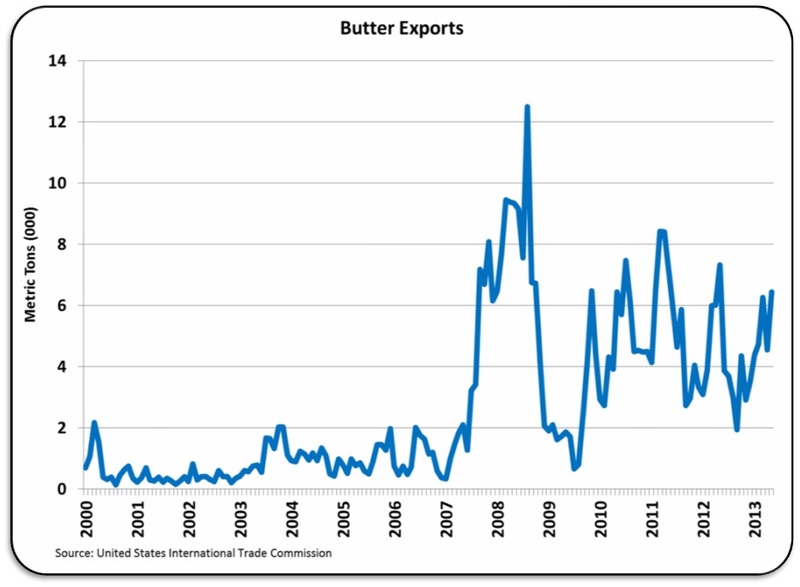 Butter exports when viewed over the last five years are decreasing. 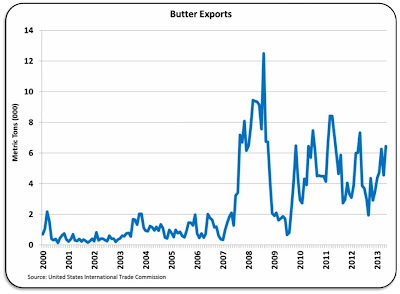 However, butter exports were up a healthy 42% in May vs. April 2013. 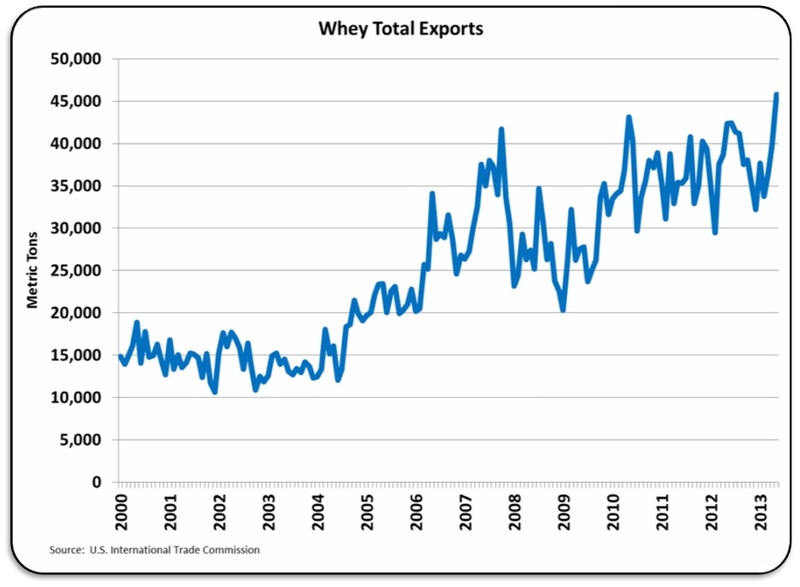 Whey exports rose through 2008, but dipped with all other exports in 2009. The 2009 dip was due primarily to exchange rates, and subsequently, whey exports have been steady for the last four years. Nearly 50% of the whey is exported and its availability is limited by cheese production. The price of whey is the basis for the "other solids" price. Whey exports were up 14% setting a new record high in May 2013 as shown in the updated graph below. Nearly 50% of all Nonfat Dry Milk is exported. Nonfat dry milk is the basis of Class IV skim milk price and therefore has an impact on the Producer Price Differential. (See the May 10, 2009 post for an explanation.) A higher Class IV price will increase the Producer Price Differential for all six Federal Milk Marketing Orders paid on components. 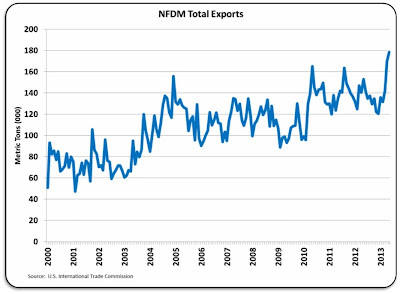 Exports remain firm and are currently at record levels. This has driven the nonfat solids price to $1.50/lb., which is a new high. 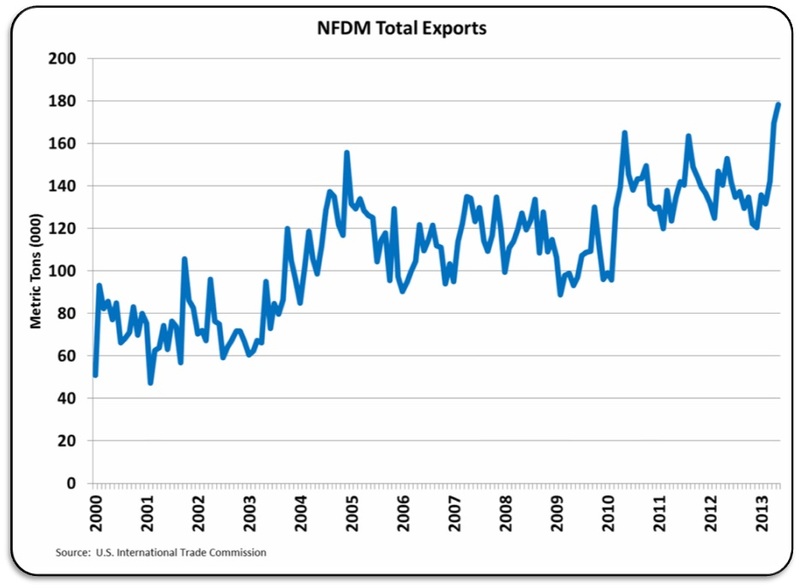 May 2013 exports increased 5% over the prior month and are at a new record high. All of the exports reviewed above are critical to keeping inventories at reasonable levels. 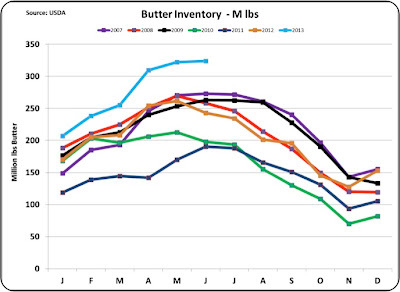 When inventories too high,, they will drive dairy pricing down. Inventories are examined below with the most updated data available. 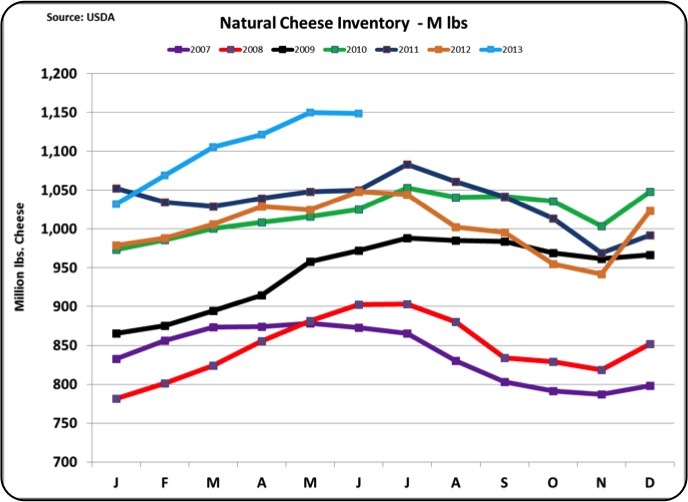 The updated chart below shows a slight improvement (reduction) in cheese inventories, but they are still very high. 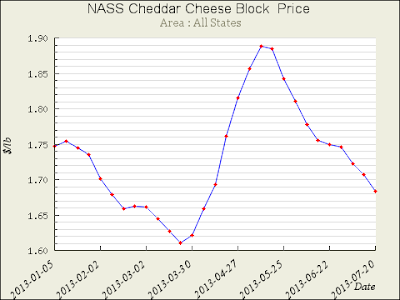 The high cheese inventory level may cause cheese prices to tumble if they cannot be reduced. The price of Class III milk is tightly tied to the NASS cheese price. 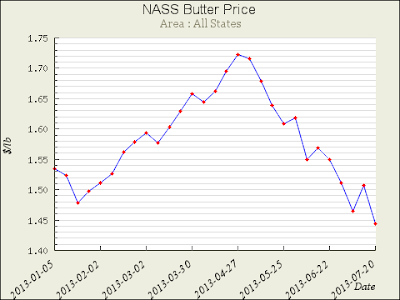 Butter inventories remain very high in the updated chart below. The high inventories have already impacted prices with a 6% decrease in June. 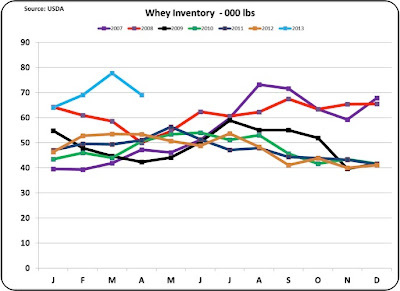 Whey Inventory for May and June are not yet available, but as of April, inventories were coming down quickly. 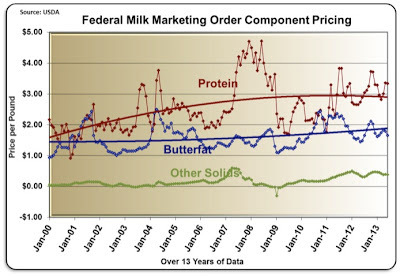 The whey price determines the "other solids" price. The higher prices for whey and therefore "other solids" have been a positive influence on milk prices. Milk prices remain good at $18.02/cwt. However, the issue of high inventories remains. 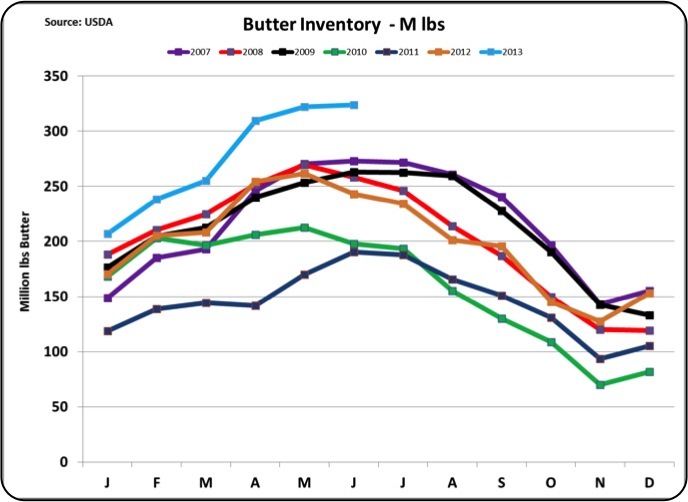 These inventories could cause a significant drop in milk prices. This is a critical issue. For that reason, the inventory and export data in this post have been updated. The futures price for Class III milk is softening and is currently in the mid $17/cwt. range.